Unusual map identifying both the 'Sea of Korea' and the 'Sea of Japan'. 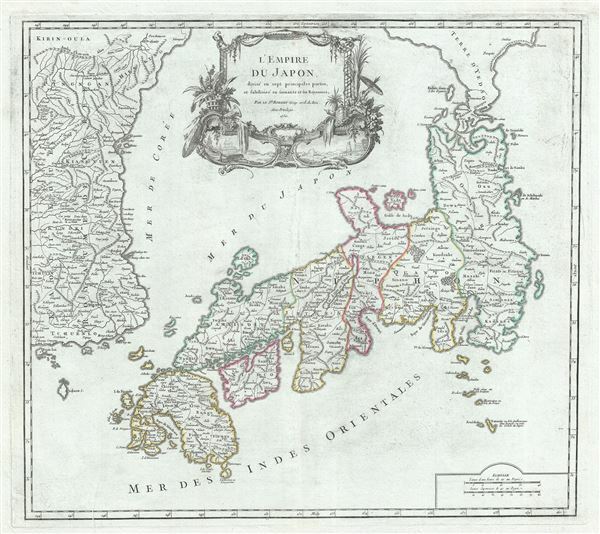 L'Empire du Japon, divise en sept principales parties, et subdivise en soixante et six Royaumes. This is a large and beautiful 1750 map of Japan and Korea by Robert de Vaugondy. Centered on the Bay of Osaka, this map covers from eastern Korea and Ngan-Hai Island eastward to include all of Tokugawa (edo) era Japan. Hokkaido, here identified as Yedso, is inaccurately and embryonically rendered off the northern tip of Honshu. Various towns, provinces, and daimyo are noted in both Japan and Korea. The sea between Japan and Korea, whose name, either the 'Sea of Korea' 'east Sea,' or the 'Sea of Japan,' is currently a matter of historical and political dispute between the countries is here identified in favor of both countries, with both 'Mer de Coree' and 'Mer du Japon' applied to the same sea. A highly decorative title cartouche appears in the top center. Drawn by Robert de Vaugondy in 1750 and published in the 1757 issue of his Atlas Universal. The Atlas Universal was one of the first atlases based upon actual surveys. Therefore, this map is highly accurate (for the period) and has most contemporary town names correct, though historic names are, in many cases, incorrect or omitted.